The Maratha is a politically dominant caste in the present day state of Maharashtra (a portion of the Deccan plateau). But when we speak of ‘Marathas’ in historical terms we include not only the primary Marathas (by caste) i.e the aristocratic (nobles) Marathas (the warrior caste,later to be known as the 96 kuli marathas *) , but also other communities (castes) in Maharashtra like the Brahmins (priest caste), the Kunbi Marathas( peasant caste), (the Maval region specific community the ‘ Mavales’), the Kayasthas i.e CKP’s, SKP’s (who traditionally worked as accountants for the kings), the Dhangars (shepherd caste), etc and all those communities prevalent in medieval Maharashtra who joined their illustrious leader Chatrapati Shivaji Maharaj in carving out a Hindu kingdom in the predominantly Mohammedan Deccan. The Marathas later galloped right upto the gates of Delhi and became a force to reckon with in the then politics of Hindustan. The Marathas may have been the last stumbling block for the British before they created their supremacy over entire India. Note*: 96 Kuli marathas were the aristocracy amongst the marathas. Their 96 clans traced their ancestory to several ruling dynasties all over India e.g Jadhavs to the Seuna Yadavs, Kadams to the Kadambas, Pawars to the Parmaras, Gujars to the Gurjaras etc. The others amongst the marathas were classified as Kunbi marathas or the peasants / farmers (toilers of the Kunbas-land). The Marathas are essentially sturdy by build and wheatish dusky in complexion (excepting the Konkan based Chitpaavan Brahmins, many of whom were unusually fair complexioned and with distinct features like grey eyes,brown hair etc alluding to a foreign gene. The Peshwas /Prime Ministers to the king belonged to this Chitpaavan Kokanastha Brahmin caste) . They were mainly peasants who toiled hard on their otherwise hilly and not so fertile land (barring the agricultural tract of southern Maharashtra). There was no aristocracy amongst the Marathas. Even the village headmen toiled in their fields, besides collecting revenue for the king. The language spoken was mainly ‘Marathi’ and its dialects (Malvani,Konkani) , especially around the coastal region. They were simple folks, and very God fearing and religious minded. This probably led to the early saint movements in Maharashtra , also called the Warkari (Bhagwatism) movements which were mainly aimed at social reforms and dilution from Vedic Brahmanism. The land of Maharashtra gave birth to several saints, poets, philosophers and teachers like Sant Dnyaneshwar,Sant Tukaram,Sant Namdeo,Sant Sakhubai, Sant Eknath,Ramdas swami etc all devoted to their central deities Vithoba ( a form of Lord Vishnu )and Rakhumai (a form of Goddess Lakshmi ). Also revered were other Gods like lord Shiva as Mahadev, Goddess Parvati as Bhavani and their son lord Ganesh as Ganapati, besides the earthly incarnations of Vishnu like lord Rama and lord Krishna. Maharashtra always had many temples in their honour.These saints ensured that spirituality and devotion to God spread to every corner of the society. The village headmen were called ‘Patils’ or ‘Khots’ (in the Konkan region). They usually came under the district heads , landowners and revenue collectors called the ‘Deshmukhs’ , the ‘Desais’ and the ‘Deshpandes’. Their accountants were called the ‘Kulkarnis’ or 'Waqnis'. The nobility usually resided in ‘wadas’(multi storeyed houses), gigantic black stoned forts (Kila, Qila,castle), which though cannot be called aesthetic were certainly most practical. The head of the fort was called the ‘Kiledar’. The ambitious and strong amongst the peasants were usually recruited in the army and those who rose in ranks were often allotted estates or ‘jagirs’. Maharashtra was called Ashmaka (present day Marathwada region) in the ancient times and was one of the sixteen great Janapadas. Some even believe that Maharashtra was Dandakaaranya, the forest land mentioned in the epic Ramayana where Lord Rama spent his exile. [The Kadambas of Goa and the Shilaharas of South and North Konkan and Kolhapur served as vassals of the Chalukyas and Rashtrakutas, and who were finally overthrown by the Yadavas]. 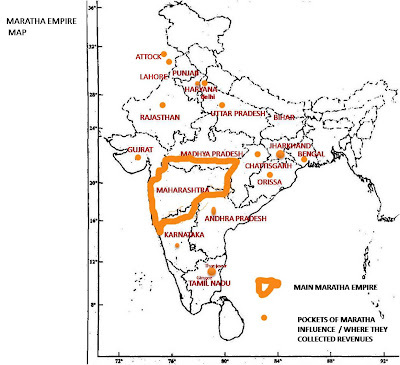 Note: The Sakas ruled parts of Maharashtra after their king Nahapana invaded the Deccan. But the Satvahana king Gautamiputra Satkarni defeated them and the Sakas continued as vassals of the Satavahanas, untill their chief Rudradaman defeated the latter Satavahana king Puloma not once but twice in battle(1st-2nd century AD). Incidently, prior to his battle with Puloma, the Saka chief Rudradaman had entered into a matrimonial alliance with the Satavahanas.and the Yadavas of Devagiri (850-1334 AD) until its invasion by Allauddin Khilji, the Sultan of Delhi.The Khilji dynasty (1290-1320 AD) ruled Deccan from their capital at Delhi. The rule of Delhi had later passed on to the Tughlaq dynasty (1321-1398 AD). Mohammed Tughlaq , a successor of the Tughlaq dynasty, made Devagiri , his capital , renaming its fort Daulatabad. The province of Deccan (i.e the region between north of river Godavari and river Krishna *note: in present day India , the Deccan areas are distributed amongst the present day states of Maharashtra, Karnataka and Andhra Pradesh ), became an independent state during the time of the Bahamani sultanate (1347-1527 AD). The Bahamani sultanate later disintegrated and split into five independent sultanates at Berar, Ahmednagar (both presently in Maharashtra state), Golkunda(presently in Andhra Pradesh), Bijapur and Bidar( both presently in Karnataka state). Soon the states of Bidar were swallowed by Bijapur and Berar by Ahmednagar, leaving only three important sultanates in the Deccan viz the Nizamshahi of Ahmednagar (1490-1636), Adilshahi of Bijapur(1490-1686) and Qutubshahi of Golkunda (1518-1687). Shivaji the founder of the Maratha empireThe legendary king Shivaji Bhosale (b.1630- d.1680 AD) created the kingdom that is now known as Maharashtra, after prolonged battles with the Bijapur Sultanate and later with the mighty Mughals ( not to exclude his minor skirmishes with the Portuguese, the English and the Dutch, who came as traders but had nibbled away small territories along the Deccan coast). Shivaji raje and his mother Jijabai were left to manage the family estates in Pune and Supa(both in Maharashtra) under the stewardship of Dadoji Kondeo, who acted as the manager of the estate and also as one of Shivaji’s early teachers. Shivaji right since childhood was fiercely independent and resented the Islamic tyranny over the predominantly Hindu population. From his youth , he started eating into territories of the Bijapuris and later the Mughals. He created an army out of the local hillmen (Mavales) and successfully captured several forts. His first prize was the fort of Torna , captured with a selected band of ‘mavalas’ at the age of seventeen.In a couple of years he had entire Pune region in his control.After the death of Adilshah, Shivaji attacked his kingdom even more vigorously. Shivajis legend grew when he killed the Afzal Khan ,the famed general of Bijapur (who had the reputation of warding off even the powerful mughal emperor Aurangzeb’s attack), and wounded the stalwart Mughal general, Shaista Khan . 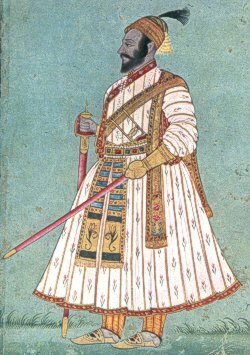 Shivajis lore reached new zenith when he hoodwinked Aurangzeb and escaped from his house arrest in Agra .Shivaji simultaneously fought the armies of the Bijapuris and the Mughals and managed to keep other potential enemies like Qutub shah, the Portuguese and the English at bay (by hook or by crook). He eventually succeeded in carving out his own independent kingdom in the Deccan. Shivaji died prematurely at fifty. He was succeeded by his son Sambhaji , b. 1657- d.1689 (Sambhaji II). After a initial power struggle with his step mother Soyrabai,Sambhaji succeeded the Maratha throne. Sambhaji was also a brave warrior and kept resisting Mughal attacks. The Mughal emperor Aurangzeb eventually had to personally descend down to the Deccan (Aurangabad, Maharashtra) with a huge force and resources and supervise the fight against the Marathas. Eventually Sambhaji was betrayed to the Mughals by his own relatives. Sambhaji was imprisoned by Aurangzeb, who asked him to accept the Islamic faith , else face death. Sambhaji chose the latter and after an horrific torture he was put to death. This martyrdom of Sambhaji spurred on the Marathas even more, and under the leadership of Rajaram (b.1670-d.1700), Shivaji’s younger son (from Soyrabai) and later his Queen, Tarabai (b.1675-d.1761) the Marathas continued their resistance against the Mughals. This was while Sambhajis son Shahu and wife Yesubai remained in the Mughal imprisonment in Delhi. Under the leadership of their king and queen, the legendary Maratha warriors Santaji Ghorpade and Dhanaji Jadhav wrecked havoc in the mughal camp. Aurangzeb died in AD.1707. The Mughals released Shahu from prison as a part of their strategy to counter Tarabai (widow of Rajaram). Shahu challenged the supremacy of Tarabai in Maharashtra and a battle of succession ensued to prove legitimacy to the throne of Shivaji. A Chitpavan Brahmin Balaji Vishwanath Bhat assisted Shahu in his claim to the throne. The forces of Shahu eventually won, and Tarabai was exiled to Kolhapur (along with her son Shivaji II), where she spent her remaining life (later a separate throne of Kolhapur was established by Tarabai until it was later usurped by her stepson). Political intrigues however continued to exist between the thrones of Satara and Kolhapur. Shahu (b.1682- d.1749) was declared the Chatrapati (King) and made Satara his capital. He appointed Balaji Vishwanath Bhat (1680-1719) as his Peshwa ( Prime Minister) .Balaji Vishwanath had initiated a treaty with the mughal emperor Farukhsiyar (during the years of a power vaccum in Delhi), which the latter refused to honour. Hence the Marathas assisted the mughal vazir, Hussain Ali (one of the Sayyid brothers) in dethroning the Mughal emperor. 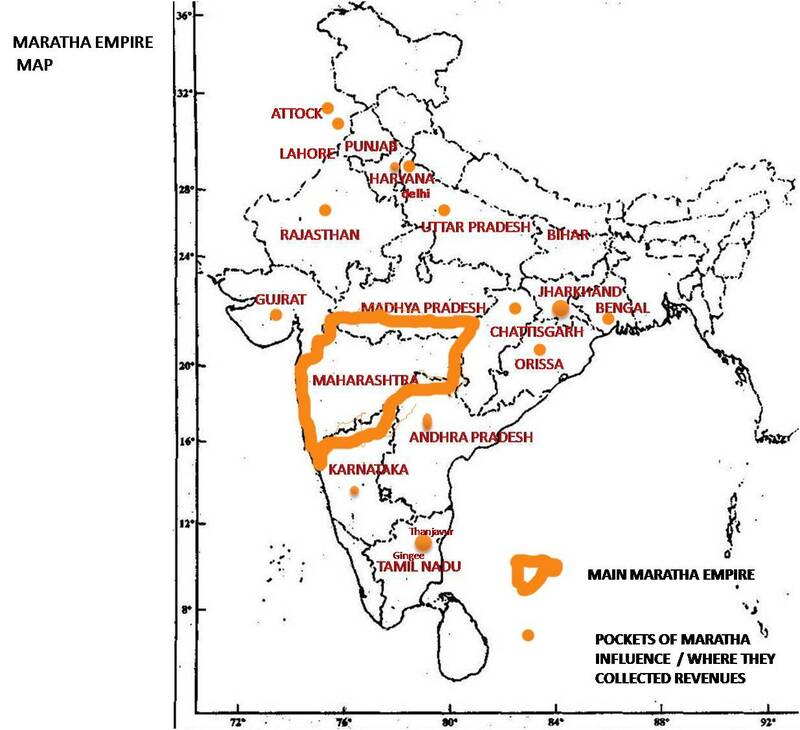 In return the Marathas extracted the right from the Mughals to collect revenue from the Deccan provinces. Shahu by now had refrained from active politics and the Peshwas gradually became the de facto leaders of the Marathas (especially after the death of the issueless Shahu raje). Though there remained titular Maratha kings in their capital, Satara, the real power was weilded by the Peshwas . After the death of Balaji Vishwanath Bhat, Chatrapati Shahu raje Bhosale appointed the young son of Balaji Vishwanath i.e Bajirao I (b. 1699- d.1740) as the new Peshwa. The decadent Mughals by now had become a weaker lot and were challenged on all fronts. Bajirao I took advantage of this situation and began the expansion of the Maratha empire. Bajirao I was called the ‘Cavalry General’ for his rapid tactical movements on horseback. He matched Shivaji in the speed and alacrity shown in launching swift attacks on his enemies.The Marathas under Bajirao I, marched right upto the gates of Delhi. On the way back, the commanders of Bajirao I’s army were established by him as governors in the various regions of central and western India which was to later form a Maratha confederacy. In years to come, they were to form their own kingdoms with allegiance to the Satara throne (Maharashtra) and the Peshwas in Pune (Maharashtra). The Gaekwads would establish themselves in Baroda (present day state of Gujrat), the Holkars at Indore (present day state of Madhya Pradesh), the Shindes (later known as Scindias) at Gwalior(Madhya Pradesh) and the Pawars at Dhar and Dewas (Madhya Pradesh). Bajiraos reign was also characterized by the famous victory of the Marathas (led by his younger brother Chimnaji Appa) over the Portuguese at Vasai (Bassein creek). Bajirao I was succeeded by his son Balaji Bajirao a.k.a Nanasaheb (1721-1761). He also proved a competent administrator . He not only maintained the boundaries of the Maratha empire but increased them considerably (with the able help of his cousin Sadashivrao , the son of Chimnaji Appa ,younger brother Raghunathrao and his generals like Holkar and Shinde. The Maratha kingdom expanded upto Attock(presently in Pakistan) during Balaji Bajirao’s reign. Another of the Maratha sardars, Raghoji Bhosale of Nagpur also conducted several incursions in east India (Bengal,Chattisgad,Orissa) and ensured large revenues for the Maratha kingdom. Nanasahebs tenure also saw one of the worst moments in the Maratha history. Nanasaheb was somewhat responsible for bringing the British in the forefront of Indian politics after seeking their assistance against the rebellious Angres of Kolaba (1754) . The Angres had been the traditional admirals of the Maratha navy. In hindsight this proved to be a costly error as the Maratha navy was virtually destroyed. The British were soon prove the nemisis of the Marathas in the years to come. Also, the Marathas faced their major defeat at the hands of the marauding Afghan king , Ahmad Shah Abdali in the third battle of Panipat (AD. 1761). Due to certain miscalculations in the battlefield and lack of support in northern India (Marathas had been tasting power for quite some time and it was having a corrupting effect on them. They were now being viewed as mercenary and rapacious and were losing popular support even amongst the Hindu kings of north India) the Marathas not only faced ignominy but also lost several of their top commanders including Nanasaheb's eldest son Vishwasrao and cousin Sadashivrao Bhau in that battle. Unable to cope with that loss, Nanasaeb died soon. He was succeeded by his second son Madhavrao I , a.k.a Thorle Madhavrao or Madhavrao the elder (1745-1772). He was a well meaning ruler, but had to face dissent from his own uncle Raghunathrao, besides the risen debts that arose from the disasterous battle of Panipat that had put the kingdom in disarray. After 1761, young Madhavrao Peshwa tried his best to rebuild the empire desspite of his frail health. The marathas not only regained their lost pride in the north but also became a force to reckon with in the southern parts of Deccan. In a bid to effectively manage the large empire, semi-autonomy was given to strongest of the knights. Thus, the autonomous Maratha states of the Gaekwads of Baroda, the Holkars of Indore and Malwa, the Scindias (or Shinde's) of Gwalior and Ujjain, Pawars of Dhar-Dewas and Bhosales of Nagpur came into being in far flung regions of the country. Even in Maharashtra itself many nobles were given semi-autonomous charges of small districts which led to princely states like Sangli , Aundh, Bhor, Bawda , Jath, Phaltan, Miraj etc. Madhavraos justice system (especially under the chief justice Ram Shastri) and citizen redressal systems were very popular and highly appreciated . Madhavrao I died prematurely at an young age after suffering from Tuberculosis. But he did manage to leave an indelible impression in his brief reign. Madhavrao I was succeeded by his young brother Narayanrao (1759-1773). But Narayanraos rule was brief to say the least as he was murdered treacherously at the behest of his uncle Raghunathrao and his scheming wife Anandibai, that too in the very precincts of their palace, Shanivarwada at Pune. Raghunathrao briefly succeeded as the next Peshwa (1773-1774), but was soon overthrown by his minister Nana Phadanvis (1742-1800). Nana installed the son of Narayanrao viz. Madhavrao II a.k.a Sawai Madhavrao (1774-1795) and managed the affairs of the Maratha confederacy through an 12 member regency council also called the Barbhai council (comprising of Haripant Phadke, Moroba Phadnis, Sakharambapu Bokil, Trimbakraomama Pethe, Mahadji Shinde,Tukoji Holkar, Phaltankar, Bhagwanrao Pratinidhi, Maloji Ghorpade, Raste and Babuji Naik). The first Anglo Maratha war of 1779, took place during his tenure(Raghunathrao sided with the British during this war in a bid to regain power). The Maratha forces led by Mahadji Shinde and the British forces met fluctuating fortunes in this war, leading eventually to the treaty of Salbhai between them in 1782 (initiated by Mahadji Shinde). As per the treaty, Sawai Madhavrao continued to be accepted as a Peshwa, but Mahadji Shinde succeeded in being recognised (by the British) as the sovereign ruler of his state Gwalior and indirectly ceasing to remain an vassal of the Peshwa. The British agreed to remain neutral in the Maratha politics thereafter. Mahadji Shinde now started increasing his power in the north. He had subsequent victories against many small rulers of central and northern India , who had earlier refused to pay him tributes. He formally established his capital at Gwalior in 1783. He even reinstated Shah Alam II as the emperor of Delhi , after he was deposed and blinded by the Rohilla chief Ghulam Qadir. Mahadji Shinde then came to be known as Shah Alam II’s honorary regent. He even subdued the Nizam of Hyderabad and concluded a peace treaty with Tipu Sultan of Mysore in 1792. By 1790, Mahadji Shinde had succeeded in re-establishing Maratha dominance in northern India. Mahadji died in 1793. He was succeeded by Daulatrao Shinde (grandson of Tukoji, the brother of Mahadji Shinde). Madhavrao II allegedly fell to his death (1795) from the palace walls of Shanivarwada. However his death remained shrouded in mystery with rumours abounding from feverish delirium to alleged suicide. Daulatrao Shinde then installed the son of Raghunathrao, Bajirao II (1775-1851) as the next Peshwa amidst a acquiesition from a reluctant Nana Phadanvis.Bajirao II could never get along with Nana whom he held responsible for his personal misfortunes and had him imprisoned for some time. Nana Phadanvis died at Pune on the 13th of March 1800. By now a civil war like situation had errupted when the two Generals of the Peshwa, Daulatrao Shinde of Gwalior and Yeshwantrao Holkar of Indore started fighting amongst themselves. Bajirao II alligned himself with his mentor Daulatrao. But Holkar ultimately triumphed,reaching the gates of Pune, and Baji Rao fled to Bombay in September 1802, into the welcoming hands of the British , who buoyed with their succesess in other parts of India were waiting to take on the final hurdle of the Marathas. Peshwa Bajirao II subordinated his position to the British vide the treaty of Bassein , December 1802, whereby the British agreed to reinstate Baji Rao in return for the Marathas allowing British troops in Maratha territory and paying for their maintenance, and acceptance of a British Resident at Pune. But this move by the Peshwa infuriated the Shindes of Gwalior and the Bhosales of Nagpur, who considered it an insult to the Maratha pride. This gave rise to the second Anglo Maratha war, 1803-05. The Shindes and Bhosales were defeated in their respective battles. The Holkars of Indore who had earlier abstained from the battle because of friction with the Shindes joined in the fray much later and compelled the British to make peace. But the second Anglo Maratha war managed to give rise to the first cracks in the Maratha confederacy. The third Anglo Maratha war (1817-18) was initiated by Peshwa Bajirao II himself after he had started feeling stiffled under British control. This war proved to be the final nail in the coffin of the Maratha empire. The British out manouvered the combined forces of the Peshwa, Yeshwantrao Holkar and Bhosales of Nagpur (this time around, the Shindes abstained from the battle). The Battle of Koregaon fought on 1st January 1818, gave decisive victory to the British. The Peshwa , Bajirao II was pensioned off and most of his territory was annexed to the British Bombay Presidency, although the Maharaja of Satara ( Pratap sinh raje Bhosale,1793 and later Shahaji raje Bhosale,1839 ) was restored as ruler of a princely state in order to placate the marathas. Shahaji raje died without a issue and the state of Satara was annexed to the Bombay presidency in 1848 . (Kolhapur remained a princely state till Indias independence from the British rule in 1947). The northern portion of the Nagpur Bhonsle dominions, together with the Peshwa's territories in Bundelkhand , were annexed to British India as the Saugor and Nerbudda Territories. The Maratha kingdoms of Indore, Gwalior, Nagpur, and Jhansi became princely states, acknowledging British control. There was a final attempt by the nominal Peshwa Nanasaheb II (b.1824, an adopted son of Bajirao II) along with his minister Tatya Tope to revive the Maratha glory. He assisted the mutineers in what is considered as Indias first war of independence (Sepoy Mutiny of 1857). Rani Laxmibai of Jhansi (a Maratha vassal queen of Jhansi, in present day Uttar Pradesh) demonstrated great valour during this period, as did Tatya Tope. However after the fall of Kanpur, Nanasaheb disappeared without a trace. His minister,Tatya Tope was captured and executed by the British (in 1859). Till date, no one knows about the final fate of the last Peshwa. Epilogue: The indomitable Maratha spirit never submitted completely to the British. The Ramoshi rebellion of 1826 under Umaji Naik in Pune, the peasant rebellion of 1875 in Pune,Satara,Ahmednagar, the armed rebellion under Vasudev Balwant Phadake in 1879 and later active participation in the Indian freedom movement by leaders like Lokmanya Bal Gangadhar Tilak (also called the father of Indian unrest,1856-1920), Chaphekar Bandhu (who shot dead the tyrannical collector, Rand,1897), Rajguru (who was hanged along with the revolutionary Bhagat singh) and later the firebrand Vinayak Damodar Savarkar (who became a youth icon for Indian revolutionaries), bear testimony to this fact. Sources: Shivaji and his times by Sir Jadunath Sarkar (Orient Longman), Chatrapati Shivaji by Setu Madhavrao Pagadi (Continental Prakashan), Studies in Indian History (Bookhive), A History of India by Percival Spear (Penguin),Maratha history by Kincaid, History of the Mahrattas by Duff. as per my knowledge the Deshmukh's were the district head and Deshpande's were the accountants while Patil's were the village head and Kulkarni's were the village accountants. How did you became 'Rajya Adhakshaya' ha ha ha lol, just kidding. This is a really nice blog, compilation of history of Marathas. I am really thankful for this information. Very Informative.. thank you soo much for all the efforts in compiling all this info for naïve knowledge seekers like me..